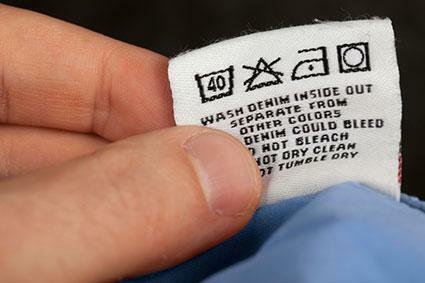 If you've ever accidentally ruined a favorite article of clothing by cleaning or drying it the wrong way, you learned the hard way about the importance of clothing care labels and following the instructions they provide. Laundry symbols on care labels depict care instructions for washing, bleaching, dry cleaning, machine drying, air drying, and ironing. These trademarked symbols were developed by a Swiss organization called GINETEX, (International Association for Textile Care Labeling) as an international standard of care labeling for the textile industry. The symbol for machine washing clothes and other household fabrics depicts a small bucket or pail of water. This is the first symbol you will see on a care label. Dots inside the bucket represent the temperature of water to use -- more dots mean more heat. Numbers refer to the water temperature in Celsius. A bucket of plain water with no lines underneath or dots inside means the garment can be machine washed on a normal setting with agitation, using any detergent and the hottest water available. A single dot inside the bucket indicates machine wash on cold, not exceeding 30C or 65 to 85F. Two dots indicate machine wash on warm, not exceeding 40C or 105F. Three dots indicate machine wash on hot, not exceeding 50C or 120F. Four dots indicate machine wash on hot, not exceeding 60C or 140F. Five dots indicate machine wash on hot, not exceeding 70C or 160F. Six dots indicate machine wash on hot, not exceeding 95C or 200F. Lines underneath the bucket of water tell you which machine cycle to use. More lines mean a more gentle cycle. One line underneath the bucket indicates to use the permanent press cycle, with a cold rinse before the spin. Two lines indicate to use the gentle or delicate cycle, with gentle machine agitation and a shorter wash cycle. If you see the following symbols, do not put the garment in the washing machine. A hand over or inside the bucket indicates you should hand wash the item with a gentle detergent and water. A bucket that is crossed out means you shouldn't machine wash and is usually followed by dry cleaning or hand washing instructions. The symbol used for bleach is a triangle. According to Textile Industry Affairs, about 98% of all washable textiles are safe in some type of bleach - usually color safe or oxygen bleach. If bleach is not mentioned or represented by a symbol, it may indicate any type of bleach can be used. However, to minimize the risk of damaging the garment, the American Cleaning Institute recommends to do a small patch test first. Mix a small amount of bleach with water using the manufacturer recommended ratio. Dip a cotton swab into the mixture and dab it onto an inside seam. If there is no change in color, it should be safe to use. An empty triangle indicates to bleach when needed with any type of laundering bleach. A triangle with diagonal lines inside indicates to use color safe, non-chlorine bleach only. A triangle that is crossed out means do not use any type of bleach. The garment is not colorfast, or the material is unable to hold up to bleach. Both machine and air drying symbols are represented by a square. As with washing, temperature is indicated by the number of dots. A square with a large, empty circle inside indicates normal machine drying at the hottest temperature available. A square with a large circle and a single dot indicates normal machine drying on a low setting. A square with a large circle and two dots indicates normal machine drying on a medium setting. A square with a large circle and three dots indicates normal machine drying on the high setting. A square with a large, solid or filled-in circle indicates normal machine drying with no heat or the air only cycle. One line underneath a square with a large circle inside indicates to tumble dry on the permanent press setting. Two lines underneath the square with a large circle inside indicate to tumble dry on the gentle cycle. If you see the following symbols, do not put the garment in a machine dryer. A square with a large circle inside that is crossed out means do not tumble dry. A square that is crossed out means do not machine dry. The following symbols instruct methods for air drying. A square with a semicircle at the top indicates to line dry either indoors or outdoors. A square with three vertical lines inside indicates to drip dry, usually by hanging a dripping wet garment on a line. A square with a single horizontal line indicates to lay the garment flat for drying. A square with two diagonal lines in the upper corner indicates to dry the garment in the shade, out of direct sunlight. A crossed out symbol of a twisted towel indicates you should not wring or twist the garment to remove excess water. An ironing symbol is represented by a small figure that looks like an iron with a handle on top. It also looks similar to a slightly flattened, square-shaped, lowercase "a." An empty iron symbol indicates you can iron at any temperature, with or without steam. An iron with one dot indicates a low setting, 110C or 230F, with or without steam. Two dots inside the iron indicate a medium setting, 150C or 300F, with or without steam. Three dots inside the iron indicate a high setting, 200C or 390F, with or without steam. An iron with crossed out lines underneath means do not use steam when ironing. A crossed out iron means do not iron. For home laundering, you only need to be concerned with the following two dry-cleaning symbols. Dry-cleaning symbols with letters tell professional cleaners which type of solvent to use and diagonal lines indicate when to use low heat, reduced moisture, the short cycle or no steam. An empty circle indicates to dry clean only. An empty crossed out circle means do not dry clean. Bleaching instructions, including do not bleach or non-chlorine bleach only. No symbol is required if any type of bleach can be used. Care labels must remain permanently attached to the textile item throughout its life expectancy. Safe cleaning methods shown on a care label act as a care warranty. If you followed the clothing care label's directions and the garment is damaged in the process of cleaning or drying, return it to the store where you purchased it and ask for a refund or exchange. If the store doesn't help, ask for the manufacturer's name and contact information. An explanation of the problem in writing should help resolve the issue.